When I started planning my first aquarium, I kept seeing the coolest accessory in some of the fish stores – a magnetic glass cleaner. I knew that it had to be part of my shopping list as it seemed like such a cool product to help with tank maintenance and be fun at the same time. The big name in magnet glass cleaners is “Mag-Float” so I decided to purchase their product. All magnetic glass cleaners have the same concept: a glass scrubber that stays on the inside, a handle that stays outside, both of which are coupled by magnetic force. You just move the handle portion along the glass surface outside the tank and the inside scrubber follows along. The advantage is that you can clean your tank glass of algae anytime and you don’t have to remove the aquarium top to get inside with a tool. 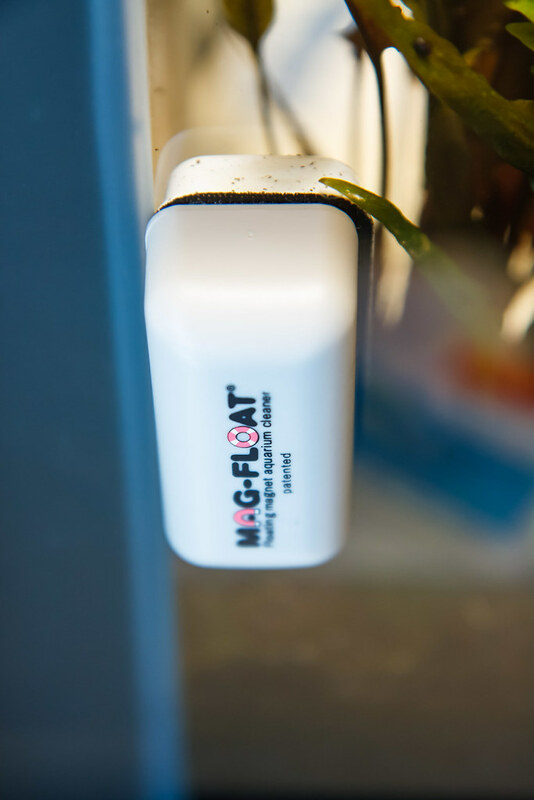 Mag-Float cleaners have a unique and desirable feature in that the scrubber part that stays inside is sealed and filled with air so that if you remove the handle from the glass, the scrubber floats to the top and is easy to retrieve. The alternative would be that the scrubber would sink to the bottom and you would have to go fishin’ for the thing. 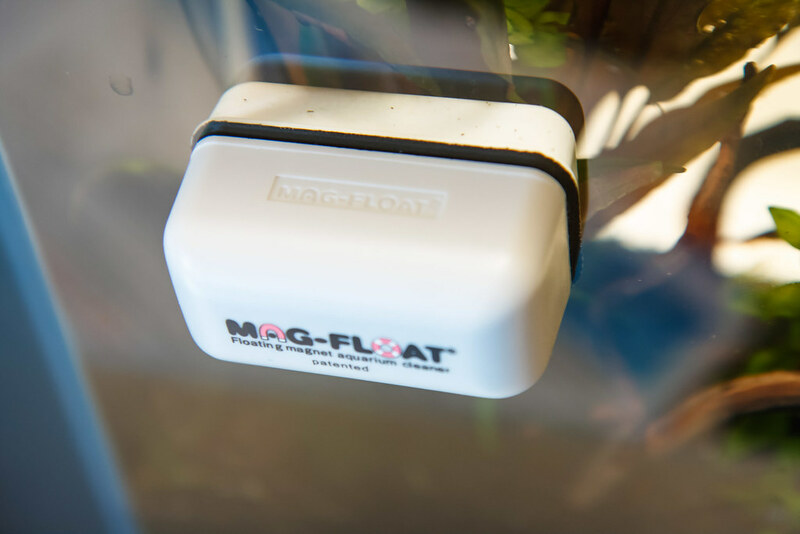 Mag-Float cleaners are entirely covered in plastic and perfectly sealed – no need to worry about the actual metallic magnet being exposed to your water. 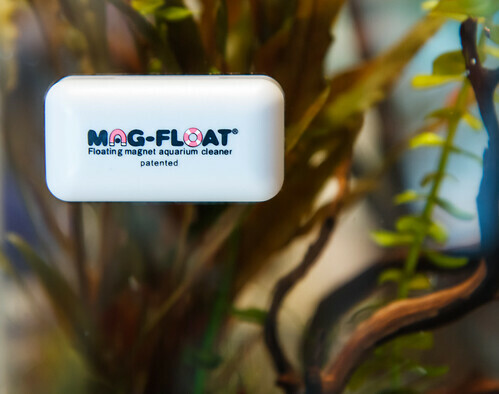 Mag-Float has an extensive lineup differentiated by sizes ranging from nano aquariums up to commercial size models for use on large scale aquariums (think sea world). There are some sizes that are also divided into types suitable for glass or acrylic tanks. All models are suitable for both salt and freshwater aquariums. Float-20: This cute little cleaner works for small, round fishbowls. It is unique from the rest of the lineup in that the scrubber and handle are both round instead of rectangular. Works for glass up to 3/16″ (5mm) thick and is glass and acrylic tank compatible. Scrubber and handle are 2″ (51 mm) diameter. Float-30 : A small cleaner recommended for tanks up to 30 Gallons (114 Liters)and glass up to 3/16″ (5mm) thick. Measures 2-3/8″ (60 mm) by 1-3/8″ (35 mm) and a depth of 1″ (25 mm). This is the model that I chose and that I will fully review. Float-125: They call this their medium size scrubber. It is recommended for tanks up to 125 Gallons (143 Liters) and glass up to 3/8″ (5mm) thick. Measures 4″ (102 mm) by 1-3/8″ (35 mm) and a depth of 1″ (25 mm). Float-350: Their large model. It is recommended for tanks up to 350 Gallons (1,325 Liters) and glass up to 5/8″ (16 mm) thick. Measures 3-1/4″ (83 mm) by 2-1/2″ (64 mm) and a depth of 1″ (25 mm). Float-500: Are you a monster fish keeper? If so, this is the one for you. It is recommended for tanks with glass between 3/4″ (19 mm) thick and 1-1/4″ (32 mm) thick. Measures 6″ by 2-1/2″ and a depth of 1″ (25 mm). Float-1000: Are you on a first name basis with Shamu? Consider this model. It is recommended for tanks with glass between 1-1/2″ (38 mm) thick and 2″ (51 mm) thick. Measures 8-1/4″ (210 mm) by 3-1/2″ (89 mm) and a depth of 1-3/8″ (35 mm). Float-25A: This is a very nice size for nano aquariums and they say it is suitable for use on both glass and acrylic. It is recommended for tanks up to 10 Gallons and glass up to 3/16″ thick. Measures 1-3/4″ by 1″ (25 mm) and a depth of 3/4″. Float-35A: Same size information as the Float-30. Float-130A: Same size information as the Float-125. Float-360A: Same size information as the Float-350. Float-510A: Same size information as the Float-500. The models labeled as “Medium” and larger feature replaceable felt (handle) and scrubber pad sets. For my Spec V aquarium, which is a 5 gallon (19 Liter) aquarium, I decided to go with the Float-30, which they call their “small” model. The other model in contention was the smaller Float-25A. I was confused if this model had any concessions for acrylic that would hinder it’s use on glass, so I decided to go with the glass specific Float-30. The product is very enjoyable to use. I had not read any instructions regarding how to use and I wasn’t sure how to deal with getting it around corners. I just gave it a shot, moving the handle part around the corner, and the scrubber part inside dutifully snapped around the straight edge to the adjacent glass. Neat! 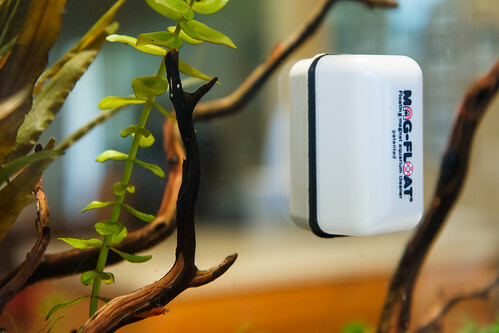 No need to get in there to move the magnet around – you can go all the way around your aquarium and clean every side, then park it in the corner. Even though this model is a bit big when parked inside my Spec V, I usually just leave it in there and it’s not very distracting. The only caveat to maneuvering this magnet around corners in a nano is that you should make the transition about midway up your aquarium. If you are too low, the sudden flop of magnet against side will disrupt the substrate; too high and you end up splashing water over the edge. The handle component that stays outside the tank has a felt pad that moves along the glass. It’s worth checking this every so often to make sure it hasn’t picked up debris that could be scratching the outside glass. The scrubber part has a more aggressive pad for removing algae. It looks like the rough side of Velcro – tiny, and stiff, nylon spears covering the surface. It is quite rough and stiff; algae doesn’t have a chance up against this cleaner. The biggest problem you may run into in using a magnetic cleaner like this is getting grit into the scrubber, which can cause permanent scratches in your glass. This limits the use of the scrubber a bit. I have a very abrasive substrate (Seachem Flourite) and If I were to put the scrubber all the way down to the bottom of the tank, it is almost sure to pick up a fleck of the gravel and would cause havoc with scratches. It is for this reason that I get no closer than 1 cm to the bottom. Algae that builds up at this lowest level gets removed with a toothbrush during my weekly cleaning. I have already touched on the propensity of these types of cleaners to scratch glass from grit, but I don’t think that is really a shortfall to focus on. It is just the nature of use in an aquarium and something you have to watch out for. Specific to this model, (one that they call “small”) I wish that it was less deep (the dimension extending into the tank). All their models spanning from the small Float-30 all the way up to their Float-500 have the same depth of 1″. I have challenges in cleaning my tank in many areas where driftwood is placed close to the glass and this model simply can’t fit in those gaps. Even in the back of my tank where I have heaving planting, I have difficulty getting the Mag-Float between the glass and the plants without uprooting them. Shaving just 1/4″ off the depth would have made this product fit in more spaces, especially considering the tight confines of a typical small aquarium. Other than that quibble, I’m quite happy with the product and would recommend them to aquarist of all scales. If I had to replace this one in my nano aquarium, I would probably give the smaller Float-25A a shot. This entry was posted in Product Reviews and tagged aquarium, Float-30, glass cleaner, mag float, scraper. Bookmark the permalink. Best way to improve the mag float — easy blade scraper for tough green algae or coraline algae. Looks like an interesting product, but I’ve never had any trouble getting algae off the glass with the stock mag float.